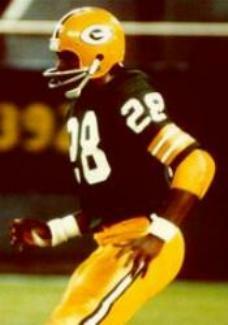 Following a college career that was capped by receiving All-America honors and being named MVP of the East-West Shrine Game, Buchanon was taken by the Packers in the first round of the 1972 NFL draft (seventh overall) and moved directly into the starting lineup. He combined with Ken Ellis to create a fast and effective cornerback tandem. Packers went 10-4 to finish first in the NFC Central while leading the NFC in fewest yards surrendered (3474). Lost NFC Divisional playoff to Washington Redskins (16-3). Buchanon suffered a broken leg six games into the 1973 season that cost him the remainder of the year but he still received Pro Bowl recognition. He was chosen again in ’74 but once again broke his leg two games into the 1975 season. He returned to spend three injury-free years with the Packers capped by a 1978 season in which he led the NFC with 9 interceptions and received consensus first-team All-NFL as well as Pro Bowl honors. Having played out his option, Buchanon moved on to San Diego in ’79 where he was reunited with his college coach, Don Coryell. He played four seasons for the Chargers, until 1982, and retired with a total of 28 interceptions (21 of them with the Packers). Buchanon was named to a total of three Pro Bowls and received All-NFL honors once.